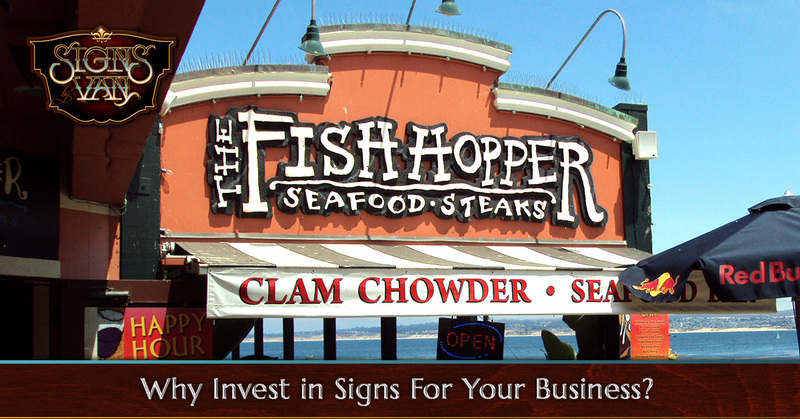 Why Invest in Signs For Your Business? There are so many moving parts that are going in different directions as a small business is developing. While business owners are distracted with other aspects of building their brand, the most important element is making your brand known. Small business owners have an advantage in today’s society. We are fortunate to live in the world of the internet and can reach audiences and consumers from across the world. Social media, websites, and online advertisements are all highly effective marketing tools, but let’s not undermine the importance of business signs. In fact, business signs have a crucial role in marketing for small businesses. Signs by Van have made thousands of signs and murals for businesses all throughout California. We understand the importance of establishing a presence to let people know who you are, and what your business is. If you’re on the fence and can’t seem to justify the cost of a custom sign for your startup company or small business, read further to learn more about the benefits of company signage. According to the Sign Research Foundation, we have learned that more than half of shoppers have reported that they have failed finding a business or, ever knowing that the business existed, due to the lack of a sign. Even worse, is when the shoppers can’t find a business because the sign is too small. The takeaway from this is to purchase a sign—a large one—that will be noticed. Investing in a quality, custom-built sign is more than just purchasing an object to sit inside your window. A sign for your business is your way to communicate with shoppers, customers, and clients without any interaction. Another fun-fact—8 out of 10 consumers have said they entered a store or a business solely based on the business’ signage. Sure, you could save some cash by simply using a flimsy board and cut-out letters and place it in our business window. But think about how the public would perceive that. What does a sign with minimalistic details say to potential customers? Would you believe us if we said that over 50% of surveyed respondents stated that poor signage has deterred them from trying a new restaurant or shopping at a new store? Well—it’s true. Remember, the purpose of a business sign is to let consumers know who you are and invite them in, not the other way around. Word of mouth is a marketing technique that likely began the idea of marketing in the first place. According to same survey, 75% of consumers recommend or tell others about a business based simply on a sign they saw. Making an impressive sign with eye-catching colors and a unique design that stands out to passersby does make an impact, believe us. Visit our previous blog about creating custom signs that effectively attract customers and learn the importance of sign details. When a small business is starting up, most business owners begin with limited financial means. Which leaves owners with tough decisions to make as far as where and how they choose to spend their money. A sign for your business may seem like it’s a steep investment to make up front, but it’s an extremely cost-effective marketing and advertising technique for your business that will last for years to come. Signs by Van broke into the business world over 30 years ago. We can certainly appreciate the hard-work and the dedication business owners (big or small) have towards building their brand. Don’t let your customers miss an opportunity to experience your brand. Browse our portfolio and Contact Signs by Van to receive your free consultation today!